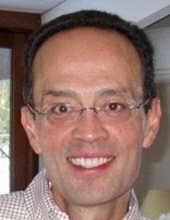 Miguel A. Cañizares, age 52, of Carlisle, MA, died peacefully at home with his wife and two boys at his side on Monday, March 25, 2019. He was the loving husband for 26 years of Sheila (Malloy) Cañizares. Born in Mexico City, Mexico on April 10, 1966, he was the son of the late Miguel and Bertha Cañizares. While being raised in Mexico City, Miguel’s love for travel began at an early age, as his family enjoyed several trips to the United States and Europe. He attended the Modern American School in Mexico City, and graduated with a Bachelor of Arts from Clark University in Worcester, MA, followed by an MBA from Babson College in Wellesley, MA. For the past 21 years, Miguel worked for Fidelity Investments, and at present time, served as a Vice President. He was also formerly employed by Brown Brothers Harriman & Co. and The Boston Company. A classical music enthusiast and supporter, he was a current board member for the Handel and Haydn Society. Miguel previously served on the board of directors for the Waldorf School in Lexington. Miguel will be forever remembered for his steadfast passion for sailing and boating, especially on the Boston Harbor. He was an animal lover and certified scuba diver. Miguel cherished the many family trips with his wife and sons to destinations including Wyoming, Grand Cayman, Europe, and in particular, an African safari in the summer of 2018. His career at Fidelity also fed his love for travel, as Miguel had the opportunity to visit over 40 countries for work during his life. He relished playing squash with work friends for the past several years. Above all, Miguel’s unwavering kindness, happy sense of humor, inspiring courage, and devotion to family will be sorely missed. In addition to his wife, he leaves behind two beloved sons, Sebastian David Cañizares and Benjamin Asa Cañizares, both of Carlisle, one sister, Andrea Cañizares, her husband John Milner, and their daughter Marianne, one brother, David Cañizares and his children Ana Paula, and Emiliano, all of Mexico City, as well as all the dear Malloy family members and friends. Relatives and friends will gather to celebrate Miguel’s life at a later date. In lieu of flowers, contributions in his memory may be made if one wishes to The ALS Association Massachusetts Chapter, 685 Canton Street, Suite 103, Norwood, MA 02062 (www.als-ma.org) or to Handel & Haydn Society, 9 Harcourt Street, Boston, MA 02116 (www.handelandhaydn.org). "Email Address" would like to share the life celebration of Miguel A. Cañizares. Click on the "link" to go to share a favorite memory or leave a condolence message for the family.